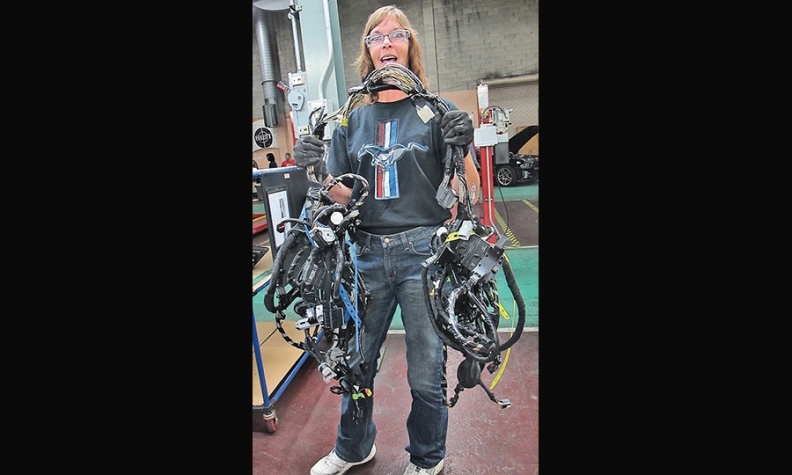 Veteran Ford Flat Rock worker and trainer Susan Spaulding demonstrates the fine points of handling a wiring harness at Ford's Flat Rock Assembly Plant. DETROIT -- Stung by several vehicle launches gone awry, Ford Motor Co. is giving workers additional training before the launch of the 2014 Fusion at the Flat Rock Assembly Plant here. Ford has hired about 1,400 workers to build the Fusion, many of them with no manufacturing experience. Since April, Ford has been training about 150 new hires every week. They take a five-day, hands-on factory simulation course meant to make them comfortable with basic tasks. Previously, workers started with classroom training and then went directly to the assembly line, where they learned on the job with a more experienced colleague in a system called "buddy up." Flat Rock is the second Ford plant to use the simulation. Ford kicked off a smaller version of the program in 2012 at its Louisville plant for the launch of the 2013 Escape. Ford says the program will become standard practice around the world. "We're making sure early-build events are high, high quality," said Tim Young, Flat Rock plant manager. "This will be part of our global vision." Ford has struggled with launches. The company had difficulties with the launches of the 2013 Escape and Fusion, and the problems peaked when the launch of the 2013 Lincoln MKZ was delayed by about four months by quality glitches. Ford begins two-shift Fusion production at Flat Rock in the third quarter. About 3,000 workers will build Fusions and Mustangs on the same line. Ford has been struggling to keep up with demand for the Fusion, which now is built only in Hermosillo, Mexico. During an eight-hour day in the Ford program, workers train at 10 stations. Tasks include installation of electrical connectors, engine build-up and installation of brake lines and radiator hoses. Workers also learn to read operator instruction sheets. Rosario Cusenza, a new hire from the Detroit suburb of Sterling Heights, Mich., who has worked construction since graduating from high school in the 1990s, says he was glad for the chance to do some dry runs on basic tasks before he starts building cars. "It was a lot of information at first. It was a little daunting," says Cusenza as he practices operating the DC Nutrunner, an electric power tool that tightens nuts during the assembly process. Cusenza is happy to be working at a car factory after his years in construction. Building the Fusion, now a big seller, gives him a steady paycheck and safer conditions than he had on building sites. Greg Hounshall, a trainer, says workers get a safety lecture at the start of the training. Ford shows workers the consequences of unsafe operation of a tool like the DC Nutrunner. Workers with long hair must tie it back lest it get entangled in the rapidly turning tool. Workers see a picture of a worker whose head was injured when the spinning tool pulled out some of her hair by the roots. Workers learn the importance of tightening bolts to specifications. "If that bolt fails, it could injure or kill a customer," says Hounshall. The training process helps weed out some people who aren't cut out for the rapid pace of work on the assembly line. Susan Spaulding, an hourly trainer and paint shop worker who has been working at the plant, once known as AutoAlliance when it was operated as a joint venture with Mazda, for 25 years, says: "Every 48 seconds a new car comes into the station. That's 72 jobs an hour." Plant manager Young says the extra training helps workers to feel comfortable right from the outset, which will help eliminate the line stoppages that happen when somebody falls behind. "Before simulated factory training, you could always tell when it was someone's first week on the line," says Young. "They were a little unsteady and unsure of what they needed to do, and it actually resulted in having to stop the line multiple times that first week. "This really helps them. It gives them a real jump on ramping up the Fusion." Jeff Hill, a training team leader, recalls two women who took the training recently. One had been a beautician and the other a housewife, he says. "They were nervous about how they were going to be thrown out on the floor. This puts them at ease."